Siskiyou Sports specializes in superior quality custom made metal art work&#44; metal art sculpting and white metal casting. New Era Team Poly American Football Stretch Fit Cap. Size: 39THIRTY Stretch Fitted Cap – For more info please check the size chart. 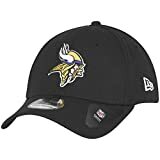 New Era Team Poly American Football Stretch Fit Cap from the Minnesota Vikings. Features: Features an embroidered logo on front and stitched New Era flag at wearer’s left side. NFL shield on back. Interior includes branded taping as well as a moisture absorbing sweatband. Stretch fit on closed back. Fabric: 95% polyester and 5% spandex. Size: 39THIRTY Stretch Fitted Cap – For more info please check the size chart. Officially NFL licensed. Bleacher Creatures are officially licensed true-to-life 10″ plush figures that stand on their own and make the perfect gift. Size: 10 Inch – 25 cm. Fabric: 100% polyester. Conforms to safety requirements of ASTM F963, EN71 and CE. Bleacher Creatures are officially licensed true-to-life 10″ plush figures that stand on their own and make the perfect gift. Size: 10 Inch – 25 cm. Fabric: 100% polyester. Conforms to safety requirements of ASTM F963, EN71 and CE. For ages 3 and up. Officially NFL licensed.